In 1997 a 13 year-old boy with no friends called Joe went online.He decided the offline world was too harsh be real. With the help of an internet psychic called Magda Magenta, Joe unleashes a series of co-ordinated attacks on the world, beginning online and spreading into the offline world. He develops an online cult populated by people who’ve also been let down badly by the real world.Nobody can trace their source until a quiet, shy professor in terrorism called Penelope Hunt discovers a link to Joe. She finds herself sucked into a conspiracy which transcends race and religion. With only a radical tele-atheist to help her, Penny decides to shut down Joe’s activities, placing her own life in grave danger in the process.’Joe is Online’ spans continents and decades. Its setting is the boundary where the online and offline worlds meet. 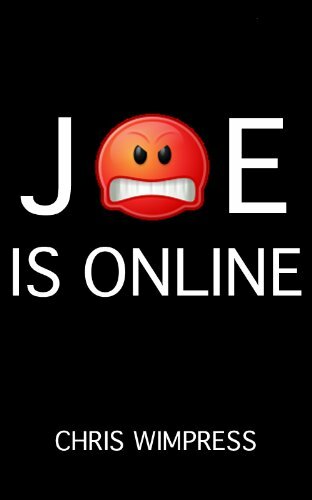 CAUTION: ‘Joe is Online’ contains very strong language and adult themes which some people might find disturbing. Ok, the first thing that I will say about this is, after reading it I profusely hugged my computer. I shuddered and experienced cold sweats while reading, and this is the reason: cyberterrorism. I think my fragile mind wouldn’t make it through another story on this topic, at least not in the near future, it’s almost too frightening to even think about. The novel is written in a very original and, dare I say, charming way. While reading it I got hit several times by a strange wave of guilt, like just by reading I was this semi-potent cyberterrorist myself, reading personal files and snooping into conversations and privy to personal information about the characters themselves. This read was an emotional roller-coaster, and by the end of it I feel sort of dazed. Before actually starting to read, I wasn’t sure a sequence of emails, blogs, chatroom logs, websites and diary entries would actually blend well enough to tell me a story; they don’t blend well, they blend marvelously. One thing I will say about this novel, it will incite and require true intellectual commitment – it’s not the sort of read you want to do while lazing about and looking for a pass-time. The topic itself, the way you’re introduced to the characters, the mixed feelings you’ll surely have about them, they’ll all keep you on the edge of your seat from start to end. And when the ride is over, you just might feel, as I do, that you’re crystal clear but so deeply unsure about it all. Is Joe really the bad guy? Is Penelope really one of the ‘good guys’? Is there such a thing? The plot spans over a considerable amount of time, without clogging your arteries with minute, meaningless details of the characters’ life every step of the way. No easy stereotype-pass to mapping out the characters here, you’ll just have to accept and embrace them with their faults and their beauties, or you’ll be horrified by them perhaps, but they won’t make it easy for you one way or the other; I know Penelope, sadly I know potential Joe-s as well, I feel like tomorrow morning I just might run into them at the coffee shop or maybe later this week at the store. This sense of presence is both marvelous and utterly disturbing, for me at least; the realization that any number of potential Joe-s are out there is something I am sure I’ll ponder on for quite a while, and I don’t just mean the potential cyberterrorist, but the victim, the neglected and abused child, the uncared for brilliant mind. Another issue that plagued me throughout reading the novel is my own startling dependency on my computer, on my files, on the illusion of my virtual privacy. It poked at me relentlessly, leaving me truly terrorized once Joe’s plot set into motion. For me, this novel does a thing of beauty; my read of it at least left me ruffled, but strangely happy. Through all the pain, the doubt, the anticipation, the fear and dread here and there, the sadness and the relief, I was constantly reminded of the most precious of rules: each coin has two sides, and there are no absolutes. No-one is completely right and no-one is completely wrong, there are always many, many sides that need to be known and heartily considered before making up your mind on any topic, any subject, no matter how uncomfortable or indeed terrorizing it may be. I feel this work is one of real substance, delivering delicious chunks of food for thought. It is special, quite special, and I am truly happy that I have had the chance to read it. It’s original, refreshing, strong, of substance and character, and quite simply put, I love it!